Oakwood Hotel & Apartments Brisbane is ideally located between the CBD and Fortitude Valley giving business travellers and leisure guests. 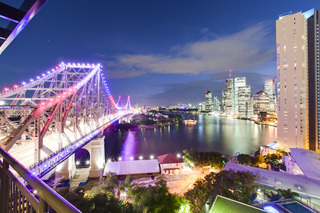 Just a short stroll along the Brisbane river you will find a plethora of restaurants, bars and retail outlets and in Fortitude Valley, experience the nightlife, Chinatown and Australian fashion labels in many boutiques. Comprising 162 spacious studios, one and two bedroom apartments and boasting spectacular city, Story Bridge and river views. Guests will enjoy complimentary Wi-Fi and facilities including a full size tennis court, outdoor pool and spa (with a magical view), sauna and gymnasium. No.15 Cafe is open daily for breakfast. City centre - 1.100 Km. Entertainment Area - 0.210 Km.